Panasonic has announced it is to dip its toes in the world of gaming, with the launch of the Panasonic Jungle portable games console. There are not many companies in the world which will take on the might of Sony and Nintendo when it comes to gaming but Panasonic has decided it is going to give it a try. The Panasonic Jungle is a portable gaming system which looks like a portable DVD player (it's a chunky clamshell device). There are a couple of games which have been announced for it: an MMO of BattleStar Galactica and a 'badass' online Machinima called Online Underground are said to be coming soon for the console. In the promo video – which has to be seen to be believed – the kicker for the Panasonic Jungle states: "We are online gaming". There's probably millions of people currently using PCs, Xboxes and PS3s who will disagree. It also says that the device is a 'mean little machine'. But the less said about that the better. The portable gaming device looks like it is geared to play MMOs on the go, which sounds like a decent idea – but it will need to tap into already successful MMOs, rather than come up with its own, if it has any hope of succeeding. The Panasonic Jungle does look like it runs on Linux, though, so you should see some Flash-based content (FarmVille etc) heading to the device. The device features a QWERTY keyboard, a high-res display and the normal gaming buttons you would expect. 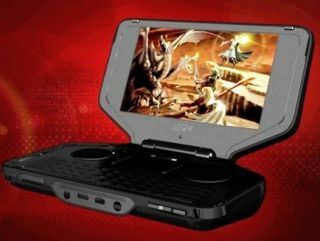 The portable gaming console market is an interesting one at the moment. It seems that gimmickry is needed to separate dedicated gaming machines from smartphones and iPods of the world. Nintendo is using 3D, Sony is trying the download only approach and now Panasonic is looking at MMOs. Panasonic will be hoping that there is a market for this and that it will have more luck with the Jungle than it did with the ill-fated 3DO.